Unam Sanctam Catholicam: Are they really the same? Occasionally, I listen to the Catholic Answers radio program on my local Catholic AM station (which I can only get when I am within ten miles of where it is broadcast, and then only between dawn and dusk). Catholic apologist Jim Blackburn was the host. A woman called in and asked about the merit of the Traditional Latin Mass. She said she had run into a lot of Catholics who seemed of the opinion that the Tridentine Mass was better than the Novus Ordo and that, to quote her, "going to it made you a better Catholic." Blackburn answered with two standard replies of the conservative crowd, neither of which were well thought out at all. First, he said that neither Mass was more meritorious. 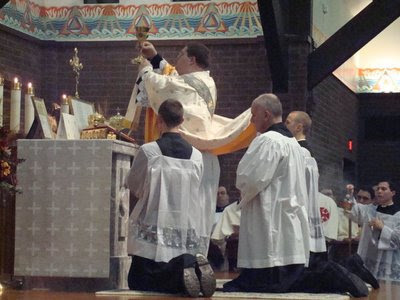 They are both exactly equal, and, as he put it, the one who goes to the Tridentine Mass does not receive any more grace than one who goes to the Novus Ordo. Second, he said that it really was not important which form of the Mass one went to because the same Eucharist was received at either Mass, which as the Body, Blood, Soul and Divinity of Christ, was just as efficacious in either form of the Mass. This argument makes two mistakes: first, it assumes that the only grace received through the Mass is the ex opere operato grace associated with the Sacrament; second, that the whole reason we attend Mass is to receive Holy Communion. As to the first argument: conservatives never tire of pointing out that the sacrament is just as valid in either Mass. Okay, we can concede this point (of course, it is questionable in some cases where there is grave liturgical abuse concerning the form and matter of the sacrament itself). However, we must remember that grace offered objectively through the sacrament does not always benefit us subjectively (ex opere operantis). How much we benefit from the Mass has much to do with our dispositions. Given this point, we ought to ask: which form of the Mass promotes a better disposition to receive the Eucharistic Lord? The answer to this must clearly be the Traditional Latin Mass, which even conservatives admit is more reverent. The more reverent the music, liturgical actions, prayers and postures, the more recollected we will be on the divine reality of what is going on at the altar. The more recollected we are, the more worshipful we are, and the more worshipful we are, the more open we are to receiving the grace of God, and therefore, we actually do benefit more ex opere operantis from the sacrament in a more reverent rite (incidentally, it is irritating to hear some speak of reverence as if it is incidental to the Mass: "Sure, the old rite is more reverent, but the Eucharist is the same in either form." If you acknowledge that one rite is more reverent, why on earth would you want to frequent one that you admit is less reverent?). The second point that is often brought up by conservatives, and was hit on by Blackburn on Catholic Answers, is that we ought not to get too worked up about liturgical matters because, after all, we are still receiving the Body and Blood of Jesus into our souls, and that is ultimately more important than whether or not rubrics are followed or what type of music is used. While the Eucharist is certainly a very important part of the Mass, we must not confuse our recption of the Eucharist with the Mass itself, as they are not the same. The Mass can exist without us there to receive the Eucharist (many people who are ignorant of history, are often surprised when I tell them that thousands of Masses used to be offered in private). The primary act of the Mass is the offering of Christ to the Father, not our reception of Holy Communion. The Mass, though intimately connected with the sacrament of the Eucharist, the Sacrament of the Eucharist is something essentially different from the Sacrifice of the Mass. The Eucharist performs at once two functions: that of a sacrament and that of a sacrifice. Though the inseparability of the two is most clearly seen in the fact that the consecrating and sacrificial powers of the priest coincide, and consequently that the sacrament is produced only in and through the sacrifice of the Mass, the real difference between them is shown in that the sacrament is intended privately for the sanctification of the soul, whereas the sacrifice serves primarily to glorify God by adoration, thanksgiving, prayer, and expiation. The recipient of the one is God, who receives the sacrifice of His only-begotten Son; of the other, man, who receives the sacrament for his own good. There are other differences between the Mass and the Eucharist as well. The unbloody Sacrifice of the Eucharistic Christ is in its nature a transient action, while the Sacrament of the Altar continues as something permanent after the sacrifice, and can even be preserved in monstrance and ciborium. This difference also deserves mention: communion under one form only is the reception of the whole sacrament, whereas, without the use of the two forms of bread and wine (the symbolic separation of the Body and Blood), the mystical slaying of the victim, and therefore the Sacrifice of the Mass, does not take place. Therefore, when we look at the Mass, we do have to distinguish Sacrament from Sacrifice. Because the notion of Sacrifice is so often downplayed nowadays, even in conservative circles, it is no surprise that Blackburn would see our reception of Holy Communion as the most important moment of the Mass. But we know that the Mass is beyond us, even beyond our reception of Christ: it is Christ's eternal offering to God the Father. The very fact that this reality can be obscured by certain types of liturgy should take us back to our first point: these supposedly "accidental" liturgical aspects of the Mass really do affect how much grace we are open to receiving and even whether or not we understand what is going on. ".....The more reverent the music, liturgical actions, prayers and postures, the more recollected we will be on the divine reality of what is going on at the altar. The more recollected we are, the more worshipful we are, and the more worshipful we are, the more open we are ...."
You are not alone in the concern for postures, reverence etc. I heard this part of the program as well - and I thought the exact same thing.